We diagnose and care for infants, children, adolescents and their families who are affected by cystic fibrosis. The Boston CF Center and Center for Young Women's Health at Boston Children's Hospital would like to share their newly developed sexual and reproductive health guides for young women with CF. This 12-guide series was developed in partnership with patients, parents, members of the multidisciplinary CF team, and adolescent medicine specialists. The guides are freely accessible online and can also be printed out for patients and families. They are written specifically for adolescent and young adult women with CF. The new edition of the CF Newsletter "The PEP Talk" is now online! Winter 2018 - Tips for Tax Season, CanACT, NACFC Research Report, Clinic Letter Survey Results and more! Flu season is fast approaching! Please refer to the below letter for this year's flu vaccination recommendations for our CF patients. News came out this morning that Abbott Canada, the company that manufactures Pediasure, Pediasure Plus, Ensure and Suplena has recalled various liquid oral nutrition supplements due to potential bacterial contamination. The recall only affects products in METAL tins with a product code and UPC # that matches the ones listed on the Canadian Food Inspection Agency's website. Abbott products in a plastic bottle are not affected. If you have any questions, please give the clinic a call at 604-875-2146. Thank you to all the families that participated. Your feedback is greatly appreciated! You are being invited to participate in a Patient Journey Mapping session. The Patient Journey Mapping session will map out the services and care you received from the Cystic Fibrosis (CF) Clinic at BC Children’s Hospital. This will help us learn what worked well and what can be improved. We are specifically interested in understanding the time in between clinic visits. Please see below for all the information. I wanted to take this opportunity to let everyone know that after working for 37 years with BC Children’s Hospital Cystic Fibrosis Clinic, I am retiring (well not really). I feel very privileged to have had the opportunity to work with each of our CF families over the years and to see so many changes in the healthcare of children with CF. It is a pleasure for me to watch as our children with CF grow into young adults and achieve their ambitions. I mentioned that I am not really retiring, that is because I now have a new and exciting position with CF Canada. CF Canada is launching a Clinical Trials Network to give more people with CF the opportunity to take part in clinical studies which will benefit the whole CF community. I am heading up this Network as the Network Manager. This is an exciting opportunity and one which we will keep you all updated on as we want patient participation in both designing studies and taking part in these studies. Even though I work for CF Canada, I am still based at BC Children’s Hospital so will be around to say hello. If you want any further information on clinical trials we will be setting up a website page on the CF Canada website. Thank you all, once again for allowing me to be part of your CF family! Discuss with your child’s school if they are able to support your child with their lunch such as allowing extra time for your child to finish lunch or leave class a few minutes early to wash hands and take their CF medications. To help spark their interest in eating their lunch, see if your child is able to participate in preparing and/or packing their lunch. Lunches can also include breakfast foods such as pancakes/waffles or leftovers from dinner. If your child is tired of sandwiches, try using a cookie cutter to create a shape or changing the bread to bagels, croissants, English muffins, pita bread. For more lunch ideas, visit Chef4cf or see our list of packed lunches (including nut-free). For additional tips on back to school, visit CF Canada’s school toolkit. This summer, wildfires in BC are again posing significant health, social and financial challenges to the population of our province. Northern BC and the Interior have again been especially affected. People with CF or other respiratory conditions are at risk of respiratory complications secondary to smoke exposure, including increased cough, wheeze or shortness of breath. These symptoms are triggered by the inhalation of smoke particles. Information about the health impacts of wildfires can be found on the HealthLinkBC website. While ultimately, nothing but the resolution of this natural disaster will completely remove this risk, there are some steps that you can take to reduce its impact on your or your child's health. Keep up to date on the local air quality status in your area. A link to the Air Quality Health Index (AQHI) can be found here. The AQHI is based on the number of smoke particles found in the air at a particular location. 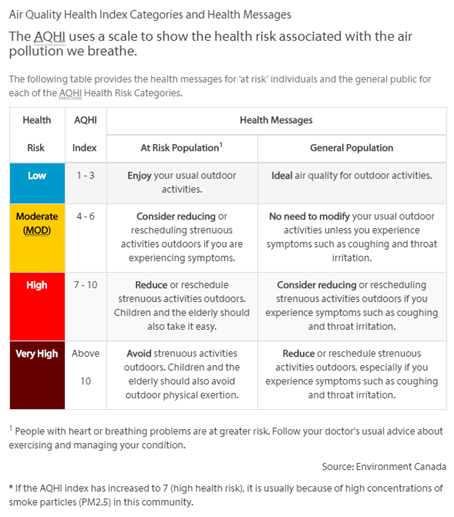 Environment Canada has issued activity level recommendations based on the AQHI. Those recommendations are listed in the image below. In brief, if the AQHI is 7 or above, children with CF should reduce strenuous outdoor activity, especially if they are symptomatic. On days where the AQHI is elevated, spend time in buildings where there is air conditioning (ideally air conditioning with HEPA particle filtration). If you do not have air conditioning at home, public places like malls, community centres or movie theatres are good options. If you are experiencing increased respiratory symptoms, Ventolin (if you have a prescription) can be useful. However, if the symptoms are pronounced or not responding the Ventolin, please contact the CF Clinic, your local family physician or Emergency Department. There is no evidence that commercially available masks effectively filter the tiny smoke particles that deposit into the lungs and are likely not effective. Emotional wellness screening (EWS) is now a standard of care for cystic fibrosis clinics. We recently evaluated our one year experience of EWS. We captured 82% of our CF youth (12 years and older) and 92% of parents of CF infants (0-2 years). With support from a one-time government grant, we have hired Roma Palmer, a registered clinical counsellor to complete EWS and offer up to 5 sessions of counselling and cognitive behavioural therapy for CF parents of children ages 3-12 years. To learn more about Roma, please visit her website. To assess and care for children from birth through 18 years old with a possible or confirmed diagnosis of CF, in cooperation with caregivers, family physicians and paediatricians. 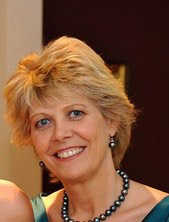 To promote optimal health and quality of life for children with CF by empowering families of younger children to care for their child independently through education and skill development and fostering a gradual independence of youth through developmentally-based transition care to ensure a seamless transfer to the adult healthcare system. To be a centre of excellence and leadership in CF care, by meeting and exceeding CF Canada's standards of care. To foster research of potential benefit to patients with CF and to their families. To teach medical students, interns, residents and allied health students about the care of children with CF. For urgent medical matters only, please call 604-875-2161 and have the on-call CF physician paged. ?You need a referral to use this clinic. Physicians: Please write a referral letter and fax it to the BC Children's Hospital Cystic Fibrosis clinic at 604-875-2349. For urgent matters, please call hospital paging at 604-875-2161 and ask for the CF On-Call physician to be paged.